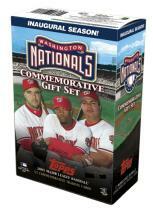 Topps Commemorates Return of Baseball to D.C.
To commemorate the return of Major League Baseball to Washington, D.C., The Topps Company has created a special trading card set of the all-new Washington Nationals. The 55-card commemorative set, which is available at www.topps.com, includes 48 Active players, 1 Manager, 1 RFK Stadium card and 5 Highlight cards. The set carries a $19.99 SRP.